Coral Bleaching the Great Barrier Reef. The Great Barrier Reef which is made up of around 2,900 individual reefs along with 900 islands having the length over 1,600 miles (2,600 kilometers) has an area of almost 133,000 square miles (344,400 square kilometers ). The figures explain the reason why it is the largest reef in the world. The reef is situated in the Coral Sea, near to Queensland in northeast Australia and the only place in the whole earth which can be detected from the outer space. The Great Barrier Reef is the largest structure made by the living creatures named coral polyps. In 1981, it was nominated as a World Heritage Site. The Great Barrier Reef is a habitation of diversity of life including more than 1,500 fish species, thirty species of whales, the dwarf minke whale, Indo-Pacific humpback dolphins, the endangered dugongs, clownfish, red bass, red-throat emperor, and forty-nine species mass spawn, numerous species of snapper, coral trout, sea snake and many more. According to BBC News, 2nd October, 2012 the Great Barrier Reef has already bleached over half of its coral cover in the last 27 years. The results show that coral cover declined from 28.0% to 13.8% between 1985 and 2012. A research published in the Proceedings of the National Academy of Sciences journal claimed that after analyzing on the condition of 217 coral reefs. The outcomes disclosed that coral cover from 28% to 13.8% – an average of 0.53% a year which done a total loss of 50.7% in the past 27-year period. The main reasons of the coral bleaching are storms, an outbreak of coral-feeding starfish and climate change. The observations are done over 2,000 surveys of 214 reefs between 1985 and 2012. The Great Barrier Reef forms the most productive ecosystem. But the reef faces the bleaching problem for the last several years due to the climate change, pollution, outbreak of crown-of-thorns starfish and fishing, shipping accidents, oil spills, and tropical cyclones, Skeletal Eroding Band, a disease of bony corals. The greatest peril to the Great Barrier Reef is to be the climate change like ocean warming. Mass coral bleaching had already been occurred in the summer of 1998, 2002 and 2006. Pollution and declining water quality are the other crucial danger faced by the Great Barrier Reef. The flood water brought more than 90% of this pollution through farm runoff including overgrazing, excessive fertilizer, and pesticide. The crown-of-thorns starfish kills the coral polyps which are the main reef building ingredients. According to a study by the RRC (Reefs Research Centre) an outbreak of the crown-of-thorns starfish made a loss of 66% of live coral, in 2000. Fishing and shipping are also threating to the coral life. With the rapid decrease in coral reef different organizations as well as individual have taken it upon themselves to conserve the coral reefs. They have organized camps, as well as educating commutes living in the habitats of coral reefs on the need to conserve them. This has become a concern since most of the habitats of the coral reefs encourage tourist activities thus leading to growth of the economy of a given country. With the decrease of coral reef, tourist activities have decreased in some areas endangering the economy of these countries. In addition coral reefs are sources of food and shelter to fish species which in turn are used as food by human beings as well as a source of economical empowerment. Among other issues affecting the coral reefs includes pollution and climate change. 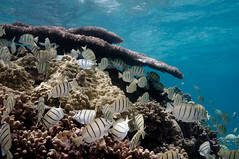 Among such organizations that have tried to save the situation is the United States of American Coral Reef Task Force. This task force was established in 1988 in order to lead the U.S. government efforts to protect and conserve the coral reefs as well as their ecosystem. It has been helping in building strategies, partnerships and providing support on ground to conserve the coral reefs. The task force also comprises of government officials and scientists who come together to discuss on the issues facing this organisms. Among the research done by this task force, it has been established that in the warmer seas and oceans there has been coral bleaching. Among the deduced cause of this bleaching is increased carbon dioxide emissions especially from factories are said to have made the oceans more acidic thereby changing the pH value of the ocean waters. This has affected the coral reefs in maintaining their structure. The United States of American Coral Reef Task Force, has tried to made some recommendations that if implemented can have a positive impact in the fight against coral bleaching. In their recommendation they argue coral reefs can be strengthened by focusing more on the climate change through reducing pollution and restoring the coral reefs habitats with clean and clear water that promotes t he growth of these organisms. They have then recommended for the Clean Water Act which they describe as a powerful tool in their efforts to realize this dream. Since the implementation of this act, industries have been able to discharge their pollution directly into the ocean and harbor a thing that has seen a lot of progress across the states and territories in the United States. The act also provides authorized setting of local water in quality standards. This is to eliminate the chemical water standards of quality that endangers coral reefs. Despite this progress there some clause of the act that has not been implemented fully. Among them is reducing the pollution from source points for example the sewerage treatment and industrial plants. If the recommendations by this taskforce are to be adhered and be implemented fully there US government will have gone a mile in saving the danger facing the coral. In turn economies of the affected states will increase and the effect of global warming will be reduced to some extent.